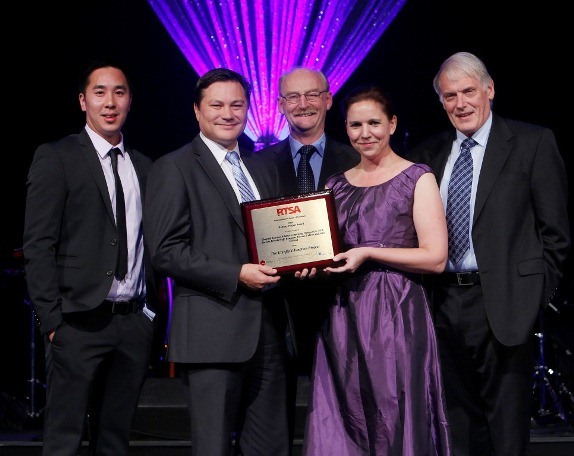 THE RTSA BIENNIAL RAILWAY PROJECT AWARD FOR 2014 IS MADE TO THE GLENFIELD JUNCTION ALLIANCE FOR THE GLENFIELD JUNCTION PROJECT IN SYDNEY. The project forms a critical part of the New South Wales Government initiative to address issues of service reliability and passenger growth on the rail network and the coincidental population growth in South-West Sydney. The scope of the project involves the rebuilding of the existing Glenfield Station and bus/rail interchange and the construction of two rail flyovers in a very constrained operational rail environment that included the South Sydney Freight Line completed in 2013. The $344million project was designed and constructed by the Glenfield Junction Alliance comprising Transport for NSW, Parsons Brinckerhoff, Bouygues Travaux Publics and John Holland. This complex project was completed on program and budget without disruption to commercial rail services. An honourable mention is made to Nairne Junction Replacement Project in Adelaide which was nominated by the South Australian Department of Planning, Transport and Infrastructure and the Tracksure Joint Venture.